We care about your financial future. Whether you are approaching retirement, or are already enjoying this stage of life, our firm is the strategic partner that will help you manage all of your post-career endeavors. Personalized and hands-on, Pegasus Wealth Strategies believes in educating our clients about financial concepts and products. Removing the mystery that often surrounds investing, insurance, estate conservation, and wealth preservation - our approach encourages clarity and absolute comprehension. 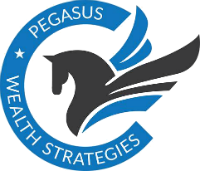 Proper and careful planning from Pegasus Wealth Strategies means that your financial well being is not only accounted for, but held in the highest regard. Utilizing state-of-the-art technology and resources, our firm approaches your financial management needs in a team-based environment. This collaboration is imperative because it encourages clarity, as well as an effective strategic outcome. Pegasus Wealth Strategies has been serving clients in areas of wealth management for nearly twenty years. The success of our firm has hinged on the establishment of long-term relationships between our advisors and our clients. We are proud of the many lifelong professional friendships we have forged throughout the past two decades, and strive to continue our legacy of commitment for years to come.